This blueberry crumb cake is easy to make and has a streusel crumb topping. This blueberry crumb cake is a variation of my Sour Cream Coffee Cake. It has few alterations and it tastes great with the addition of blueberries. It makes for a tasty breakfast or for a yummy dessert. I made this crumb cake in a 9×13 baking dish. I lined the dish with parchment paper because it makes for super easy cleanup! This cake has a layer of blueberries between two layers of the cake mix. 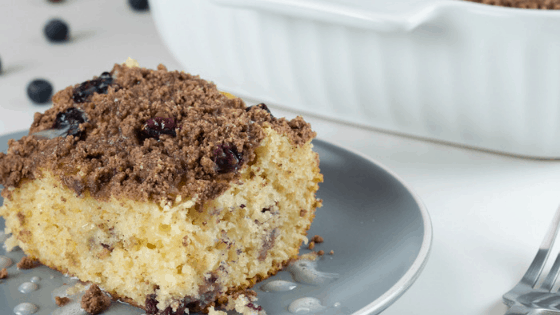 It has a streusel topping of cinnamon and nutmeg spices and is finished off with sprinkled blueberries. The key to making a moist cake is in the technique of making it. It’s important to not overbeat the mix for the cake and it’s important to not overbake it in the oven! Checking the cake with a toothpick in the center of the cake is the best way to tell if it is done. If it comes out clean, take the cake out of the oven and let it cool on trivets. Allow the cake to cool completely before adding the drizzle topping. Easy to make Blueberry Crumb Cake topped with streusel topping. Prepare baking pan by lightly greasing sides and bottom. Use parchment paper if you would like. In a large bowl, cream together butter, brown sugar, and sugar. Add in room temp eggs one at a time. Mix in salt, baking powder, vanilla extract, and sour cream. Stir in milk and add flour gradually. Melt 6 tbsp of butter. In a small bowl, mix together brown sugar, salt, cinnamon, nutmeg, and flour. Mix well and add in melted butter. Mix well. Set aside. Pour half of the cake mix into the cake pan. Sprinkle the cup of blueberries on top of cake mix. Pour the remaining amount of cake mix over the filling. Take the prepared crumble topping and sprinkle it over the cake batter. Make sure to spread it evenly across the top. Bake for about 40-45 minutes for an 11x15 pan and about 50-55 minutes for a 9x13 pan. Check the enter of the cake with a toothpick to check for doneness. Make sure the cake is cool completely before adding the drizzle topping. If the cake is warm then the drizzle with melt into the cake.